An exemplar is defined as an excellent model or typical example, worthy of imitation. In my last post I spoke about manufacturing a banjo type fitting. Now, it struck me that there may be many who have never heard this term and have no idea what a banjo fitting is. A recent visit to the Royal Air Force Museum at Cosford, in Shropshire, gave me the chance to rectify the situation. The collection includes the National Cold War Exhibition, including excellent examples of the "V" bomber type in the form of a Vulcan, Valiant and Victor. Cosford perfectly complements the Southern Branch of the Royal Air Force Museum in Hendon, North London. The Cosford Museum has an excellent collection of British Rocket Engines, including a De Havilland Sprite RATO unit and a De Havilland Spectre. It is also possible to see the Saunders Roe SR 53 aircraft, the mixed power interceptor that the Spectre was designed for. Both the Spectre and Sprite were Kerosine/HTP units. Incidentally, you can see a cutaway of the Sprite in the second edition of Sutton, on page 36. ﻿This is a banjo fitting on the top of the Sprites' Hydrogen Peroxide tank. The purpose of this fitting and its' associated pipeline was to charge the tank with compressed air from the air distributor valve. The fitting is composed of a cylindrical outer portion that is fixed to the tank by means of a hollow "banjo bolt". This has a perpendicular drilling that allows the hole in the centre of the bolt to communicate with the cylindrical portion. By this means the fluid entering the cylindrical portion is delivered through the bolts' central hole. The cylindrical portion is sealed at the top and bottom with Dowty Washers. Copper or aluminium crush washers are used in some instances. This photograph also shows a frankly beautiful example of TIG welding. The fitting in this picture is of an AGS type. As a matter of fact, it is an AGS 1130 banjo body and an AGS 1135 banjo bolt. AGS stands for "Aircraft General Standard". This is a standard for various aircraft detail components. It was used on British Aircraft for many years. 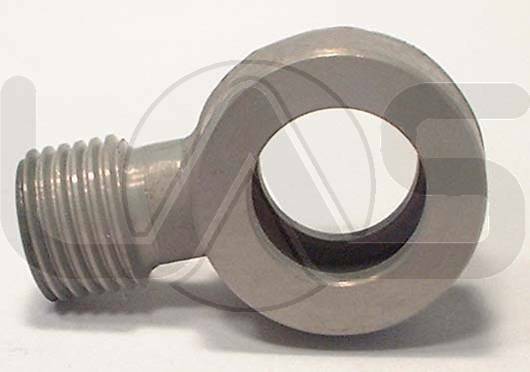 Threaded components were based around the BA system for smaller than 0.25 inch and BSF for 0.25 inch and larger. For fluid power systems, the BSP parallel thread was used. I am going to be in the workshop all next week so with any luck the next photographs I show you should be of parts that I have made. I am still working on the posting detailing the nozzle design calculations, so do look out for that.